Keeping skin moisturized, winterized and glamorized is a 24/7 process. It just doesn’t end. Winter is a good time to start incorporating a nighttime serum into your skin care routine. 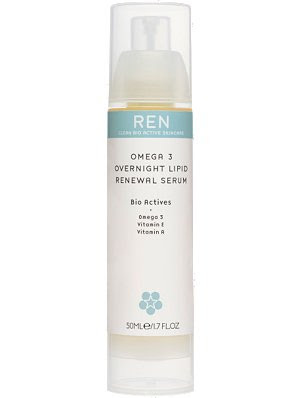 REN Omega 3 Overnight Lipid Renewal Serum is simply AMAZING! This super moisturizing serum works overnight to stimulate the skins natural process of cell renewal and regeneration. It also helps to restore suppleness and elasticity. Just one pump from the bottle, applied at bedtime, is enough to cover my face and neck area. I was a little concerned about using something oily on my skin at night but this serum is surprisingly light and doesn’t clog pores and actually sets in nicely. Oh, and did I say it smells good too? This stuff works and I’ve noticed a difference in my skin after using it for just a few days. To use: After cleansing, massage a small amount of the serum into face and neck with upward strokes until absorbed. Can be followed by a moisturizer. I know you do :) What was better? The REN facial or the WP on your wrists?